Whilst it is true that Barcelona has wonderful theaters, we need to take a short drive to visit one of the most thrilling ones that I have ever seen. 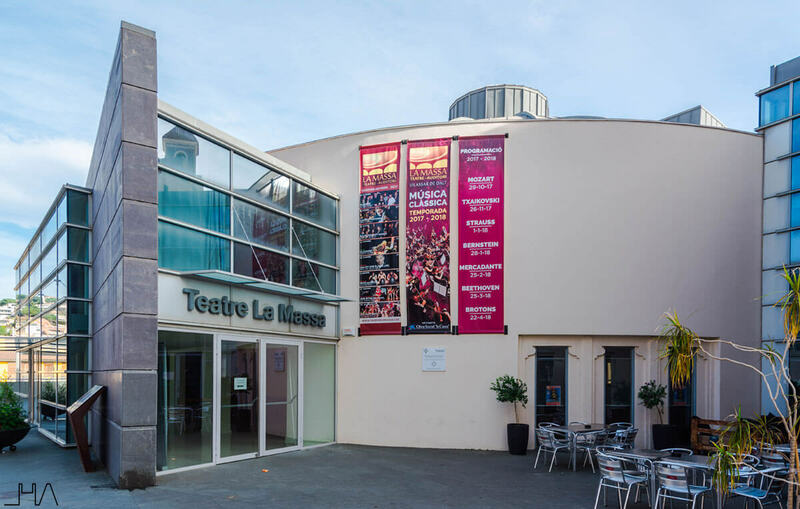 I am talking about La Massa Theater, located in the Catalan village of Vilassar de Dalt. Even though it is really close to my hometown, I didn’t know about this little treasure until I moved to New York. It is hard to believe, isn’t it? This is due to the exciting story of its author, Rafael Guastavino, an unknown architect from Valencia who changed the appearance of New York City. That said, I could have chosen one of the many buildings that Guastavino built in the United States in order to introduce this architect. 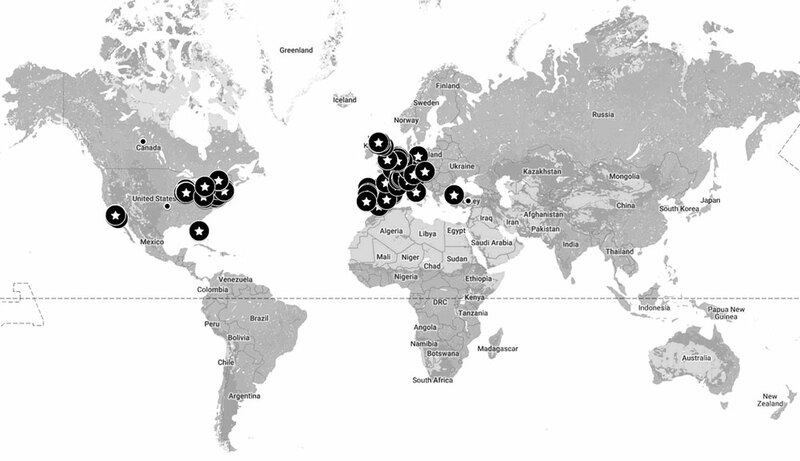 Among them, we can find the Boston Public Library, the cathedral of Saint John the Divine or the spectacular Grand Central Station in New York. Nevertheless, I preferred going back to his early years. Let’s learn a bit about the architect before focusing on his theater. ¿Who was the architect Rafael Guastavino? Rafael Guastavino was born in Valencia in 1842. However, he moved to Barcelona in 1861 and studied at the School of Master Builders. It was there where he learned the technique of the Catalan vault, which would be really important for the rest of his career. In 1881 the architect migrated to the United States for personal reasons. He moved to New York and started a new professional stage using what he learned in Barcelona. He patented the Catalan vault as Guastavino System, with which he built more than 1000 buildings in the USA. The fact that “his system” was economical and fire-resistant was crucial. The local architects, who were still affected by the fires like the Great Chicago Fire in 1871, decided to include it in their projects. This is how he ended up starting his own business in the United States, the Guastavino Fireproof Construction Company. Nowadays, we can still find his work in a lot of iconic buildings in the Big Apple. Rafael Guastavino had a very successful career in the USA until his death in 1908. Such was his fame that the New York Times published an obituary in which he was referred to as “the architect of New York”. Well, now you may be interested in knowing what the Catalan vault is, and how the architect could end up being such an important part of the history of this amazing city. The Catalan vault is a tradicional construction technique used by Catalan master builders since the 17th century. It is a type of low arch made of plain bricks to make a structural floor surface. It is constructed by laying bricks lengthwise and joining them with plaster. One of the great benefits of this system is that it is self-supporting, so it doesn’t need any scaffolding during construction. This meant that the costs were significantly reduced. Rafael Guastavino realized that this construction system had a lot of possibilities, and in 1868 he used it at the Batlló factory in Barcelona for the first time. However, the architect wanted to cover bigger areas than the traditional technique could allow. Then he decided to introduce some changes. Guastavino updated the Catalan vault technique by replacing the plaster with Portlant cement. This is how he achieved a better resistance of the vault to cover larger spans. The last Catalan vault built by Guastavino before moving to the USA was in a small building located on the outskirts of Barcelona. That is today’s visit, La Massa Theater, where we will see a beautiful example of tile vault. The architect never saw the building completed, but we are extremely fortunate to have the opportunity of seeing it as the first day. At last, the time has come to see La Massa Theater. It may not be the most famous building I have seen, but believe me when I say that it was one of the most special visits I ever did. So far, every time I visited a theater I entered through the public entrance. However, this time was different. All the lights were off when I arrived to the center of the stage. I couldn’t see anything when, suddenly, the theater lit up. There it was, just in front of me. I had never had the chance to enjoy such a special moment just for myself. Now I can show you the spectacular image that struck me that day. I owe this unforgettable experience to the person who is in charge of La Massa Theater. Not only did he allow me to see the whole theater and enjoy its architecture, but he also told me many interesting things about the building. Let’s start with its history, which dates back to 1880. A group of twelve people founded the Society for the Theater of Vilassar, and they asked Rafael Guastavino to build a new theater for their town. Though it may seem surprising, the construction work took only four months and had a very low budget. The inaugural performance took place on March 13, 1881. The building has a very simple plan. It combines a circular structure for the seating area with a rectangular stage. The best part comes when you raise the look to the ceiling, where there is a huge and shallow dome with an oculus in its center. There are peripheral vaults on steel beams surrounding this amazing space, which support the dome and create the perimeter boxes. Finally, these steel beams are supported by two lines of cast iron columns. 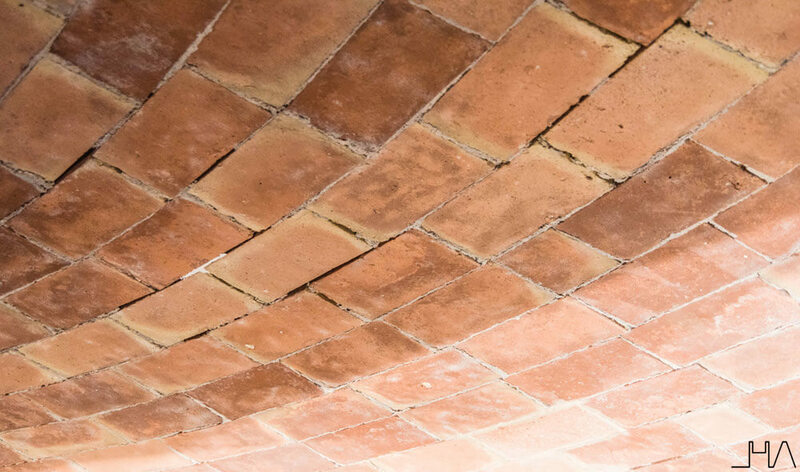 This was the first time that Guastavino used the Catalan vault for covering a large span. At the time, it was a great success. 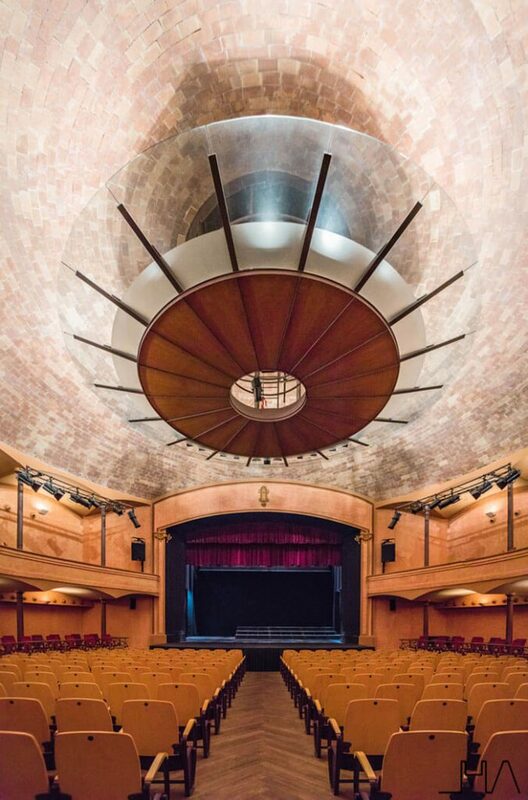 More than 130 years later, the dome of La Massa Theater still remains with the same structural function as the first day. That said, it has to be noted that the theater has undergone some changes throughout its history. Today we can see some photos of the 80s where the dome was covered by a metal louver grid. They were installed to reduce the acoustical problems caused by the curved ceiling. Luckily, nowadays we can only see them in old pictures. 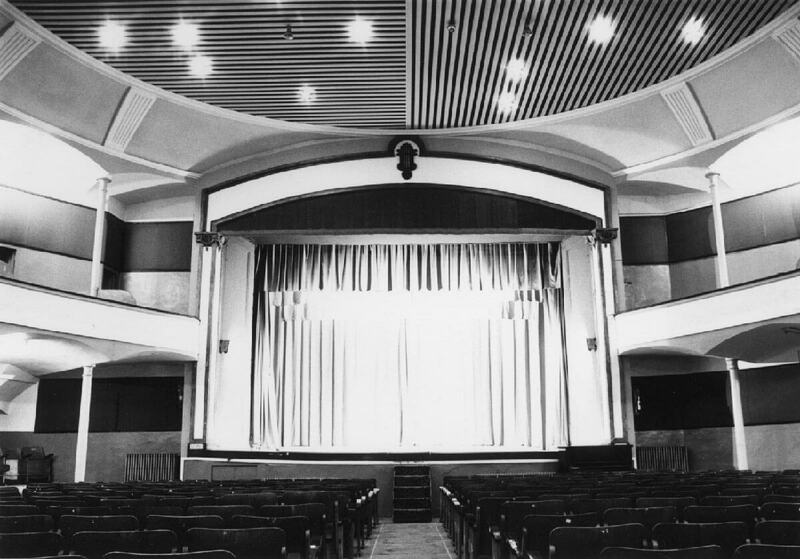 A building restoration started in 1988, but it was stopped and the theater was abandoned for more than 10 years. It wasn’t until 1999 when a complete renovation of the building started. The architects Ignasi de Solà-Morales, Lluís Dilmé and Xavier Fabré were in charge of returning the building to its original state. The spectacular lamp in the center of the main room is what attracts all the attention. 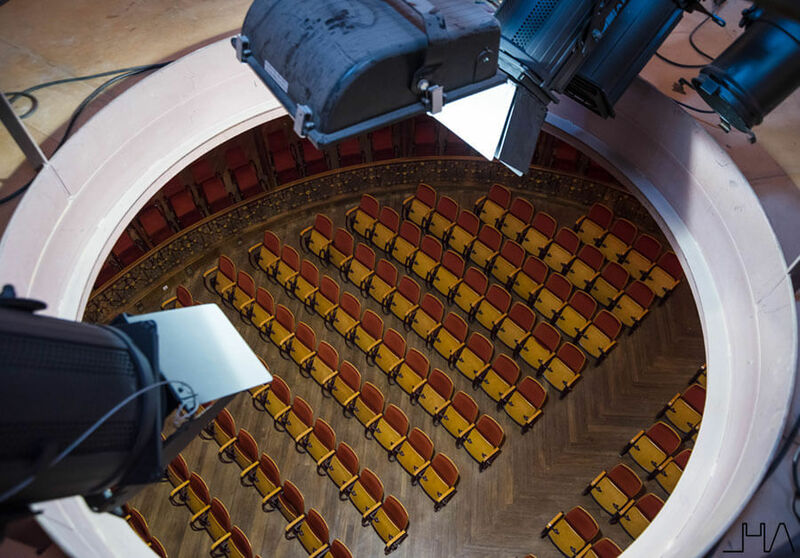 We must not forget that the restoration had to solve some problems of the theater, like the uncontrolled natural light or the poor acoustics. That is why the central oculus was covered and a circular structure with wood was installed to absorb the reverberation of the dome. Thus, we can still enjoy the spectacular vault while it also contains the lighting equipment. Before finishing my visit, I was really lucky to see the vault and its bricks closely. We went to the roof of the theater, because the access to the huge central lamp is from outside, through the old oculus. 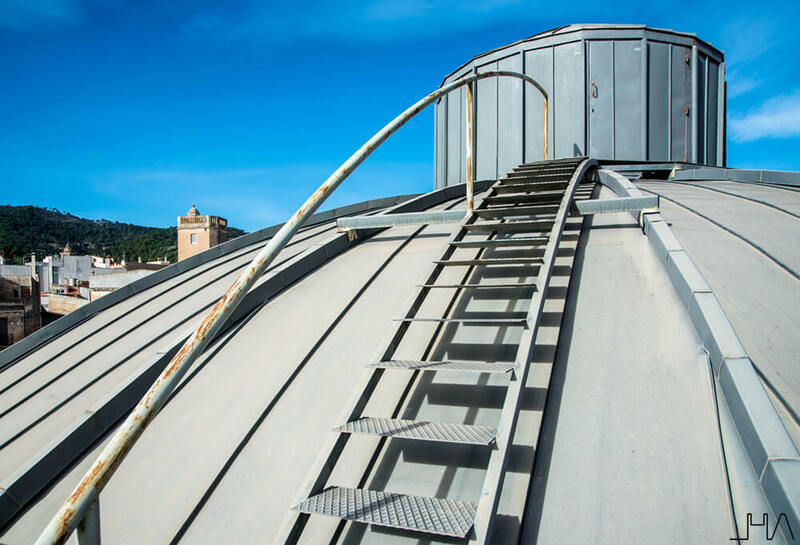 A metal roof was installed over the dome during the restoration to avoid leaks in the interior. It has a little stair to give access to the theater from the roof. Once inside the big central lamp, not only could I enjoy a close-up view of the wonderful vault, but also a different point of view of the theater. Below you have a photo of the seating area, which I could take among spotlights and electric wires. Nowadays, La Massa Theater is still a social and cultural center for the village of Vilassar de Dalt, which has less than 9000 inhabitants. 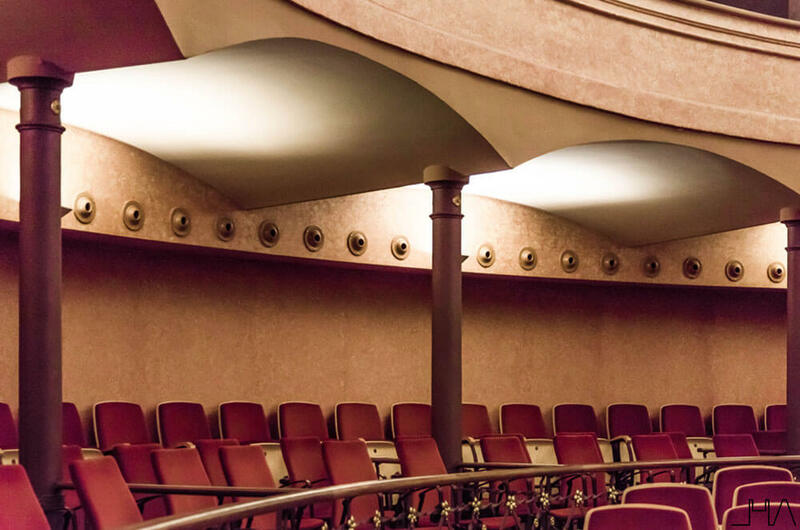 Thanks to sponsors and music lovers, the little theater has a wonderful season of classical music. I highly recommend checking the website of La Massa Theater to see the program. I think that this is the best way to visit the building and also enjoy a cultural event. Finally, you may be interested in knowing more about Rafael Guastavino and his achievements in the United States. Below you will find a great documentary film about the architect. Besides showing many interesting buildings that you should visit in the USA, you can also see La Massa Theater around minute 15. Even so, I hope you end up visiting the theater as soon as you can. Undoubtedly, the next time I go back to my city I will attend the performance of the week. Thanks to Raúl Solsona for his patience and kindness. My visit would never have been so pleasant and interesting without him.